I wanted to study abroad because I wanted to know more about the world I lived in. I wanted to challenge my comfort zone and push myself to become a citizen of the world. I studied in Spain with UA for a month in the summer and followed it with a semester traveling with Semester at Sea. I’ve never learned more about humanity and culture than I had in that year. There so much that goes on every single day that we are completely unaware of and it was eye opening to see the lifestyles of people from various countries across the globe. I took “Camel Trek” while I was visiting Morocco during the second week of October in 2016. 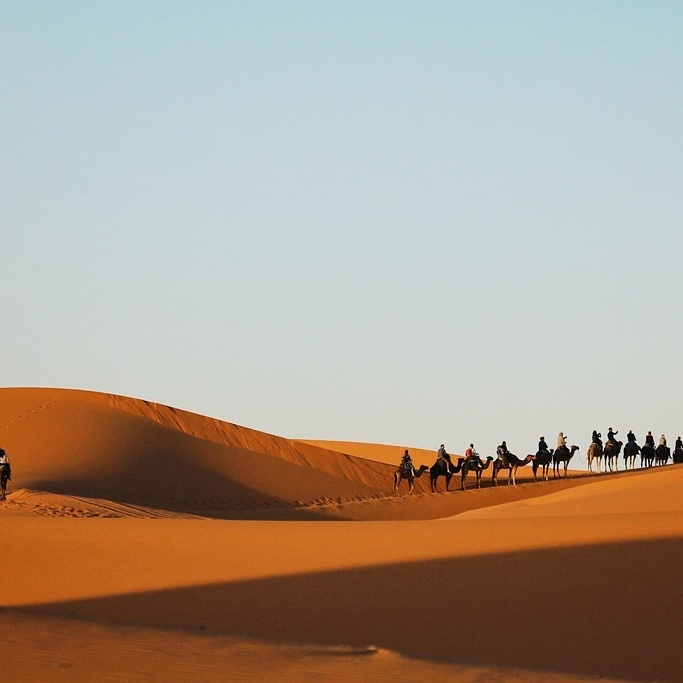 I had joined some friends for a camel trek into the Sahara desert to camp for a night. After that night on the dunes watching the constellations move across the sky, I arose at daybreak for the trek back into civilization. I took the photo specifically as I waited on my camel at dawn and watched the others ride up and over the dunes, disappearing into the horizon. I took the picture because I couldn’t believe I was seeing such a scene with my own eyes. The whole experience seemed unreal, intangible. I couldn’t stop thinking, “How did I ever get so lucky to live this life?” I had to capture the moment. I had to share my experience and the best way I knew how was through photography. After traveling across 11 countries with Semester at Sea, this particular photograph continued to be my favorite amongst hundred others. The experience was so unique and I treasured it dearly. Also, as a photography fan, the composition of the photo excites me. The shadows on the dunes and the string of camels dipping into the horizon… it’s as if I’m still there every time I see it. My (study abroad) experience was beyond words. There’s no way to describe the change that happens within you while you dive into a foreign place. It enhances your global perspective. There’s no way to communicate the difference it makes in your mind and heart and soul. So I just say: try it yourself if you can, and you’ll never regret it.